My dad retired a little while ago and now has time to do some of his hobbies, among them breadmaking and beer brewing. We're big fans of both hobbies and like to encourage him to keep up with his good work, and of course, encourage him to run his samples by us so he can continue to perfect his craft. 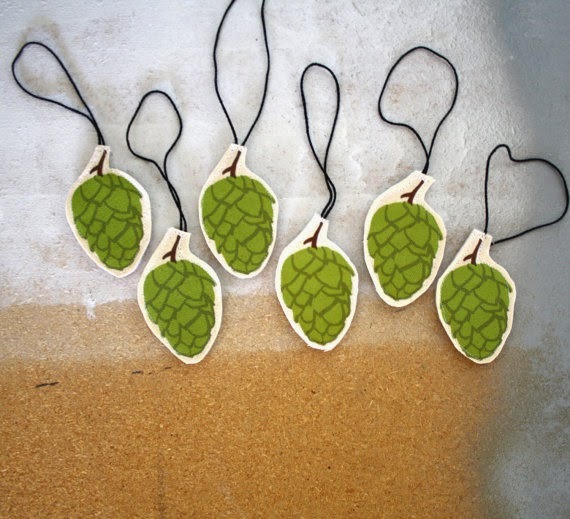 Inspired by these ornaments on Etsy (https://www.etsy.com/listing/170882014/hop-ornaments-christmas-beer-fan-gifts?ref=sr_gallery_6&ga_search_query=hops+ornaments&ga_search_type=all&ga_view_type=gallery) , we decided to make our own via Spoonflower. 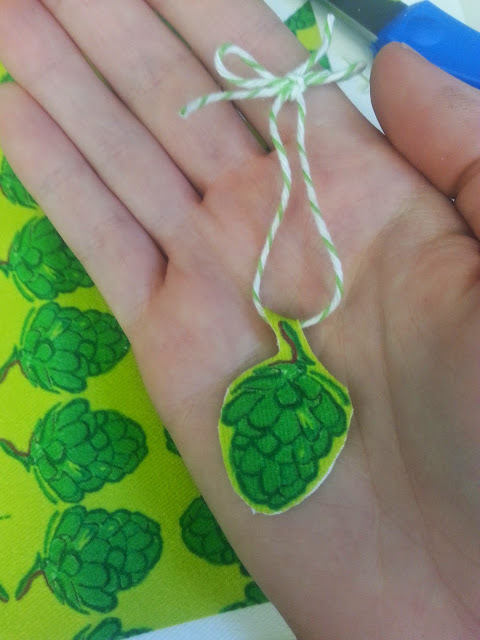 We did a Microsoft Paint version of a hops drawing at our desk, and edited it in PicMonkey and Spoonflower to have it printed as a mirror image, so that the ornament would have a front and back that matched up perfectly (see picture below for fabric layout). These ornaments (see second picture) are so cute and took only seconds to make. 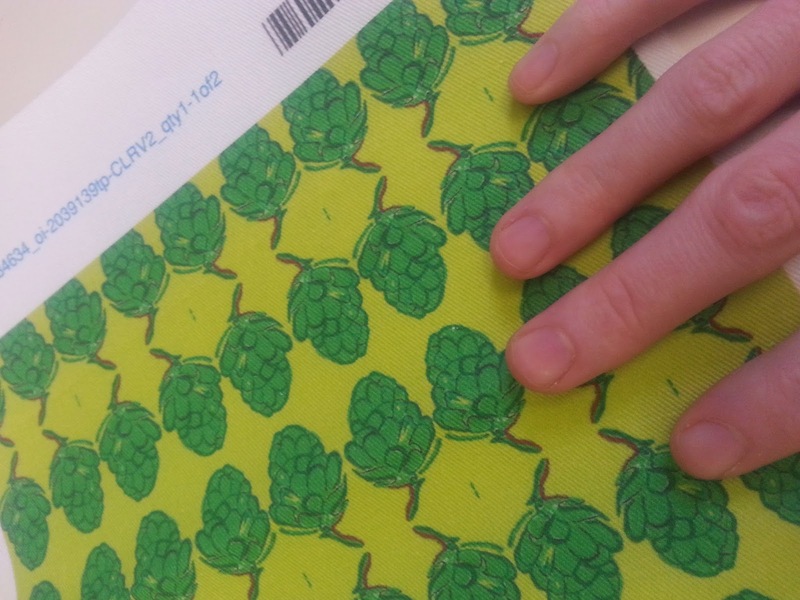 We ordered the fabric as an 8x8 test swatch of one of the pricier Spoonflower fabrics, the heavy cotton twill, and we'd recommend it to anyone looking to do a similar project - in fact, we're going to do a similar project with a surprise design in the near future. We had some baker's twine laying about and so we just cut out the mirror images, folded at the stem, looped the twine between both stems, and glue stick'd the hops together. We didn't bother with the sewing because these are quite small and the glue actually did a good job of closing everything up nicely, but we noticed that the Etsy ornaments were sewn, so use your best judgment. We were able to make about 20 of these out of one 8x8 square ($5 flat rate), so obviously this is a very, very cheap way to make a few cute ornaments for the tree. I'm a huge fan of mini ornaments strewn among the larger ornaments for balance and because it makes the tree itself look fuller with each tiny branch having something lightweight hung from it. These types of ornaments do the trick. They are actually even cuter in person.